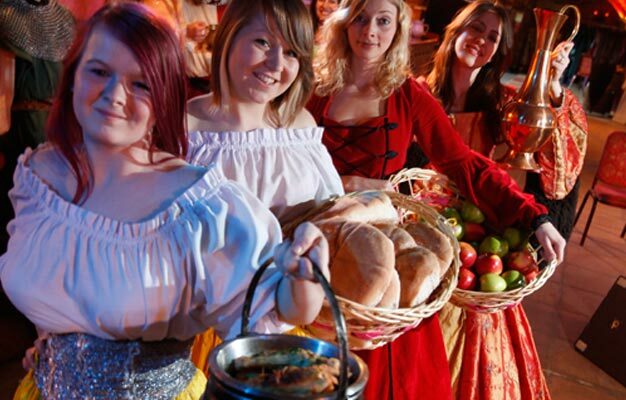 Experience a medieval feast with entertainment included at The Medieval Banquet in London. A night full of entertainment, food, music and dance awaits you. Buy tickets to The Medieval Banquet in London here! Centrally located just two minutes from Tower Bridge and the Tower of London is the historic St Katherine Docks located alongside the River Thames. Come join Henry VIII and his knights, troubadours, magicians, jugglers and medieval tumblers for a 4 course meal with ale and wine brought to your table by the dancing wenches. See the menu here There will be plenty of entertainment and many opportunities to dance, sing and bang your fist on the table and shout for your wench to bring more food and drink! - On Tuesday to Saturday doors open at 7.15pm and meal and entertainment starts at 7:45pm. - On Sunday doors open at 5.15pm and meal and entertainment starts 6.00pm. - Meal and entertainment ends at 10.30pm. You may stay until 11:30pm. - Your voucher/e-ticket will be sent to your e-mail address. - Child prices apply for children under 18 years of age.